Article originally published on Greenpeace International; Audio/edited recorded by Cortes Radio. Why are global politics so dysfunctional that the UN climate meeting requires a 15-year-old Swedish grade school student to speak the truth? Why does a coalition of youth, outside the COP 24 climate meeting, articulate a more comprehensive action plan than the delegates inside the meeting? Enough: Change the system itself! Greta Thunberg from Sweden. Over 10,000 people took to the streets of Helsinki to demand swift action on climate change. Greenpeace and other NGO’s encouraged citizens to join the march and show the political decision-makers that there’s no time to waste when it comes to climate change. We need to act now. And yet, politicians and delegates travel around the world, stay in luxury hotels, and dither about our children’s future, as carbon emissions rise, species blink from existence, rivers run dry, and ancient forests burn. It is no wonder, and a welcome sight, that the world’s youth have seen enough and are not impressed. 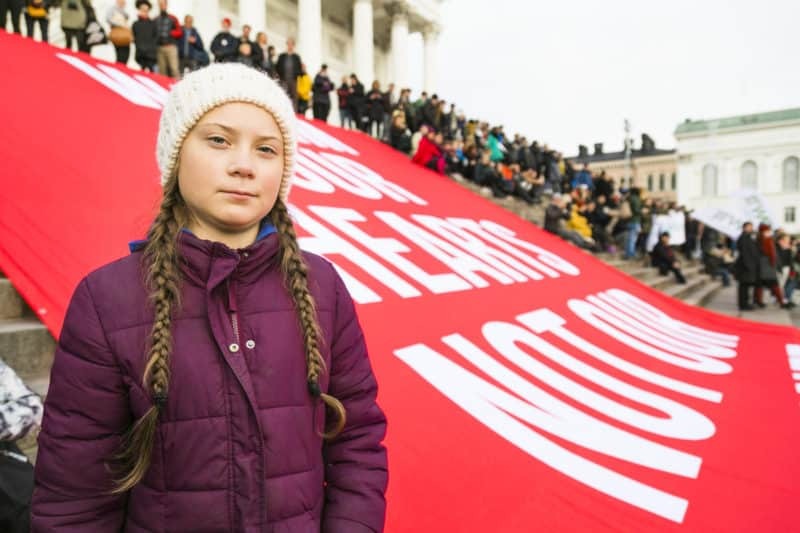 On 12, December 2018, at the COP 24 UN climate conference in Katowice, Poland, Swedish student Greta Thunberg finally said what the politicized delegates have failed to say. Thunberg is a direct descendant of Swedish chemist Svante Arrhenius, who predicted global heating from carbon emissions in 1896. During this year’s heat wave and wildfires in Sweden, Thunberg gained world attention by staging a school strike outside the Swedish Riksdag, holding a sign that read, “Skolstrejk för klimatet” (school strike for climate). She demanded that the Swedish government reduce carbon emissions. Her actions inspired student strikes in over 270 cities around the world. Meanwhile, outside the conference, 330 organizations from 129 countries presented six “People’s Demands for Climate Justice,” beginning with “Keep fossil fuels in the ground and end subsidies to fossil fuel industry”. Thunberg is correct about years, decades, of pep-talks and positive ideas that have failed to reduce carbon emissions. Scientists have known about the threat of global heating since Thunberg’s ancestor, Arrhenius calculated the impact in the nineteenth century. The modern world has been meeting about the crisis for almost forty years, since the first World Climate Conference in Geneva in 1979. Since then, human carbon emissions have doubled from about 5 gigatonnes of carbon per year (GtC/yr) to 2018’s record-breaking 10.88 GtC/yr. Meanwhile, CO2 concentration in the atmosphere has grown by 22%, from 337 parts per million (ppm) in 1979 to over 412 ppm today. These results represent an enormous failure on the part of world governments. She is also correct about the unfulfilled promise of “green growth,” a notion made popular in 2012, at the UN Conference on Sustainable Development in Rio de Janeiro, by the World Bank and the Organization for Economic Cooperation and Development, both dedicated to industrial growth. However, recent studies show that “green” or “sustainable” growth are delusions. In 2018, anthropologist Jason Hickel reviewed recent data and wrote in Foreign Policythat “green growth .. is based more on wishful thinking than on evidence.” A 2012 study by German resource economist Monika Dittrich and colleagues showed that even under optimum conditions, decoupling economic growth from resource use has not occurred. The United Nations Environment Programme came to similar conclusions in 2016 and 2017 studies. They predicted that by 2050, with continued growth, resource use would double to 180 billion metric tons per year (Gt/y). Ecological footprint data shows that a sustainable level of resource use is about 50 Gt/y, a limit breached in 2000. Wealthy nations, such as the UK and US, have claimed to “decouple” energy use from GDP, but only because they have exported energy-intensive industries and now import finished goods — cars, computers, trinkets — which represent massive embedded energy. Based on recent data, Thunberg is entirely correct that “green growth” is a delusion. Finally, Thunberg is correct that the only paths out of our predicament require that we “change the system itself.” Global heating, biodiversity loss, environmental toxins, nutrient cycle disruption, and all other ecological challenges arise as symptoms of a single, larger biophysical reality. Humanity is in a state of ecological overshoot. There is no way to grow out of overshoot. All genuine solutions to overshoot require that the species contract, not grow. As Thunberg says, it is time to face these facts, to slow down, and to “pull the emergency brake” on economic growth. This is the reality that the climate conference delegates are too scared to voice. Our status quo economic system — industrial capitalism — requires growth to survive. Without endless economic growth, the $250 trillion global debt to bankers and investors cannot be paid. As Thunberg says, “Our biosphere is being sacrificed so that rich people .. can live in luxury.” The biosphere is being sacrificed so bankers can receive their interest payments, to keep stock prices up, and to avoid facing reality. The current system is biased for the rich to get richer, as multitudes suffer, as the ecosystem collapses, and as other species disappear. Economist Jeremy Grantham concurs in “The Race for our Lives,” when he states that “capitalism and mainstream economics simply cannot deal with these problems.” Corporate sabotage of the climate talks is not new. In the 1920s and 30s, Standard Oil, General Motors, and Firestone Tires acquired and sabotaged public transportation throughout North America for the purpose of replacing efficient public transport with gas-guzzling cars. Today in Nigeria, Ecuador, Canada, in the Arctic, around the world, and at these UN conferences, oil companies are still sabotaging the public interest for profits. Her speech stands as one of the most hopeful moments for ecological realism in recent years. Greta Thunberg’s COP24 speech, 12, December 2018, Lifegate. “Young Activists offer their climate demands at COP24,” Kate Wheeling, Pacific Standard, 5 Dec. 2018. Johan Rockström, et. al., Planetary Boundaries, “A safe operating space for humanity,”Nature, 2009. Anthony D. Barnosky, et. al., “Approaching a state shift in Earth’s biosphere,” Nature, v. 486, June 7, 2012. “Green economies around the World? Implications of resource use for development and the environment,” Dittrich, M., Giljum, S., Lutter, S., Polzin, C. ifeu, Institut für Energie- und Umweltforschung, Heidelberg, 2012. “Decoupling energy use and economic growth: Counter evidence from structural effects and embodied energy in trade,” Vincent Moreau, Applied Energy, 1 April 2018. “Resource use expected to double by 2050,” UNEP, United Nations Environment Programme, 2017. 2012 .. 70 billion metric tons / year, 2050 .. 180 billion metric tons / year, sustainable level of resource use .. ~ 50 b metric tons / yr, boundary breached in 2000. “No way out? The double-bind in seeking global prosperity alongside mitigated climate change,” T. J. Garrett, Earth Systems Dynamics, Department of Atmospheric Sciences, University of Utah, 2012. “Global Material Flows and Resource Productivity; Schandel, H., et al. ; UNEP/IRP(2016). “The Race for our Lives,” Jeremy Grantham, GMO Quarterly, 2013. “US Coal Forum Greeted With Jeers At COP 24 Conference,” Steve Hanley, Clean Technica 11 Dec. 2018. Rex’s column reflects on the roots of activism, environmentalism, and Greenpeace’s past, present, and future. The opinions here are his own. Follow him on Twitter or visit his personal website.